For America’s electric cooperative statewide consumer publications, Friday, January 5, 1996, saw a four decades-plus odyssey come to an end. On that sunny, crisp early winter day, in a cramped conference room just off the lobby of the old Holiday Inn Holidome in Nashville, Tennessee, six statewide editors gave their blessings to documents creating a Texas-based cooperative to handle United States-wide display advertising sales. National Country Market Sales Cooperative (NCM) was born. 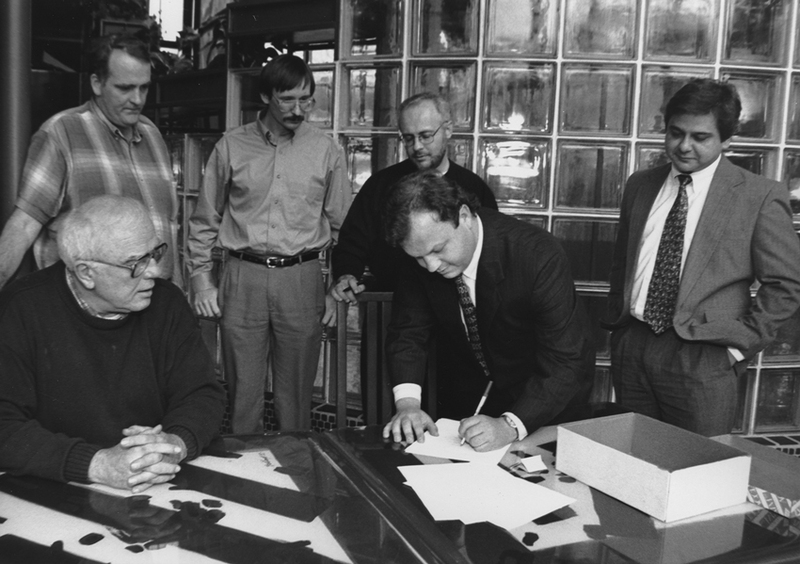 During a January 5, 1996, meeting in Nashville, Tennessee, Perry Stambaugh, editor of Penn Lines magazine, signs papers formally incorporating National Country Market Sales Cooperative (NCM). Looking on, from left, are fellow NCM incorporators Bill Roberts, editor of Oklahoma Living; John Bruce, associate editor with Cooperative (then Rural) Living (VA); Jim McCarty, editor, Rural Missouri; Rod Guge, editor, The Tennessee Magazine; and George Macias, editor, Texas Co-op Power and NCM’s first executive director. The concept behind NCM was in keeping with the seven cooperative principles: develop a member-owned and -governed cooperative that would pool the circulation strength of statewide magazines to sell national print (and later digital) advertising. To properly solemnize the event, NCM’s “Founding Fathers”—Bill Roberts, editor of Oklahoma Living; John Bruce, associate editor with Cooperative (then Rural) Living (VA); Jim McCarty, editor, Rural Missouri; Rod Guge, editor, The Tennessee Magazine; George Macias, editor, Texas Co-op Power, who would later be named NCM’s first executive director; and myself, then editor of Penn Lines—called in The Tennessee Magazine staffer Robin Conover to snap a photo of the official incorporation signing. Conover, however, found no place suitable inside the hotel to take the picture. So she promptly marched us down the street to a building with a well-lit atrium, where the paperwork was actually signed. As incorporators of a national advertising sales cooperative, the six of us were attempting to buck history. An NCM-like undertaking had been launched by statewide magazines before (Rural Electric Consumer Publications Cooperative, 1952–68) only to come crashing down due to perpetual financial crises, ineffective management, and, according to a January 1968 memo, “the complexities posed by the many diverse interests of the members and the nature of a Cooperative sales effort which is apparently alien to professional publishers’ representatives and salesmen.” In fashioning NCM, we—in conjunction with our compatriot statewide editors—took great pains to apply the lessons of that failure and frame a structure that could endure. But we also knew NCM would only survive if member publications could find common ground and support it. In many ways, NCM’s roots can be directly traced to August 1985 (interestingly, in Nashville) when 11 electric cooperative publications united under the guidance of Tom Shirley, business manager for The Tennessee Magazine, to form The SunRise Group. Richard Johnstone, on board only four months as editor of Virginia’s Rural Living (now Cooperative Living) magazine, attended the inaugural gathering. After serving as editor of Rural Living for 14 years, Johnstone took over as executive vice president and general manager of the Virginia, Maryland and Delaware Association of Electric Cooperatives in 1999. The SunRise Group held true to its name: Harkening the dawn of an effort to seek national advertising for statewide publications. But its reliance on outside sales reps convinced editors that only by doing what cooperatives do best—collaborating and working together, utilizing their own tenacity and resources—would a truly national effort succeed. So a group of statewide editors gathered for lunch over shrimp etouffe, seafood gumbo and other Cajun delicacies at a French Quarter seafood house during the 52nd NRECA Annual Meeting in New Orleans in 1994, and resolved to move forward with a new organization. Two months later, in April, SunRise participants officially voted to look into advertising sales alternatives, including the possibility of a new, cooperatively owned and controlled national advertising entity. Over the next year, following a request from SunRise publications, a National Electric Cooperative Statewide Editors Association task force began gathering information and laying the groundwork for what would ultimately become NCM. What fueled interest was a recognition by statewide editors and their bosses that the electric cooperative world was changing and survival of the publications could very well be at stake. Electric deregulation was rearing its head, and no one had any idea if “small” not-for-profit cooperatives could survive the free-market onslaught many experts were predicting. For example, if distribution cooperatives “dropped the magazine” to save money to gear up for “consumer choice,” then statewide magazines would lose income from those subscriptions. Finding new sources of revenue for statewide publications—namely increased advertising—seemed a must to keep the titles economically viable. There was also an understanding, garnered from SunRise frustrations, that statewide publications needed to finally step up and take control over their advertising destiny, not hand it off to third parties who primarily wanted to make money for themselves. Even seemingly “logical” sales agents to partner with—such as statewide farm publications—didn’t grasp the electric cooperative audience or mission. And perhaps most critically, to avoid the pitfalls of editors passing around management of their advertising arm on a rotating basis, the organization demanded professional, dedicated staff that “got” electric cooperative statewide magazines. In March 1996, the NCM board, after a national search, selected Macias—a key player in NCM’s formation—to build the cooperative from scratch. Joining him in leaving the security of statewide association employment behind was Texas Co-op Power editorial assistant, Laura (Ford) Klein. With space rented from Texas Electric Cooperatives, Inc., NCM opened shop in Austin, Texas, on a shoestring budget, but with a lot of optimism. To help get the infant cooperative off the ground, and boost revenue, it was determined early on that NCM’s advertising sales had to be supplemented by national sales made through the existing network of statewide advertising representatives. As more roadmap decisions were made, every member on the incorporating board carried a vision—in some cases unrealistic—for the day when “NCM would finally arrive.” For me, it was when every member publication received a four-color John Deere lawn mower ad with dealer listing. While NCM’s initial expansion proved to more of a slog than many hoped, and more mountaintops remain to be scaled (paying of capital credits? ), NCM has largely succeeded in the mission set out for it. Thanks to NCM, statewide magazines have seen a dramatic improvement in advertising quality. Gone the way of the passenger pigeon are dubious black-and-white septic tank, nose-hair clipper, vitamin supplement and copper-bottom cookware ads so common in pre-NCM days. In their place are four-color ads from The Bradford Exchange, Water Furnace, and yes, even my Holy Grail, John Deere tractors. Like any start-up enterprise, NCM has seen changes. Initially, NCM Founding Fathers believed that statewide editors—since they were principally responsible for the financial health of their publications—should retain control over governance of the organization. It was felt that allowing statewide advertising representatives, who could earn commissions for selling ads through NCM to other magazines, to serve on the board constituted a conflict of interest. Advertising staff, though, were allowed to advise the board on policy. Within a few years, many editors sensed that their focus should remain on editorial content, not sales. Accordingly, NCM members changed the bylaws to allow statewide advertising managers to serve on the board. Growing sales advertising volume has seen NCM add more headquarters staff to keep up with the workload. A few programs, such as selling ads for statewide directories, ran their course and have been retired. But perhaps the most significant benefit—one that the Founding Fathers actually discussed—has come through training offered by NCM. Across the electric cooperative statewide publications sphere, an enhanced professionalism in marketing and advertising sales has helped magazines solidify their standing with statewide managers, directors, subscribing cooperatives and readers. Member publications are in better shape financially, and stand out as more visually appealing (thanks to better ads in its pages), because of NCM. Perry Stambaugh served as NCM’s first board vice president from 1996–2001. He held the post as editor/director of communications with Penn Lines from 1990 to 2006 before being named senior director & editor of NRECA’s Rural Electric Magazine and Straight Talk from 2006 to 2013. He currently serves as director of member communications and editor of CFC Solutions News Bulletin with the National Rural Utilities Cooperative Finance Corporation (CFC).